John Wood, Marian Seldes and Victor Garber in the original production of Deathtrap. Deathtrap is a play written by Ira Levin in 1978 with many plot twists and which references itself as a play within a play. It is in two acts with one set and five characters. It holds the record for the longest-running comedy-thriller on Broadway, and was nominated for four Tony Awards, including Best Play. Deathtrap was well received by many and has been frequently revived. It was adapted into a film starring Christopher Reeve, Michael Caine, and Dyan Cannon in 1982. [SPOILER ALERT] The play centers around Sidney Bruhl, a previously successful playwright, who has had a series of box office flops and is having trouble writing. Sidney mimics reading a play that he tells his wife, Myra, he has received from a student of his, Clifford Anderson. Sidney asserts that the student's play is a certain hit. Interspersed with reassurances that he is only kidding, he frightens Myra with suggestions that he may kill Clifford in order to steal the script. Sidney telephones Clifford to invite him over to give him suggestions on improving the play. Clifford's play is, like the actual play itself, entitled Deathtrap, and is also a one set, five character thriller. Sidney arrives back at his den, having picked up Clifford at the train station. After socializing briefly, Sidney determines that there are no other carbon copies or xeroxes of the play in existence and escalates the sense that he may kill Clifford. To the horror of his wife, Myra, Sidney appears to choke the young man to death and drags him off to bury him. As Sidney returns from disposing of Clifford's body, psychic Helga ten Dorp comes to the Bruhl home to warn Sidney and Myra that she is having visions of terrible pain coming from the Bruhl home. Helga wanders around the house revealing visions that appear to be only partially correct. Sidney, relieved that Helga has not accurately envisioned the murder, reassures Myra to the point that she admits her own secret wish that Sidney was going to go through with the murder to steal the script. As Sidney and Myra are about to go to bed, Clifford, covered in mud, snatches Sidney from behind, and apparently beats Sidney to death. Myra, shocked and terrified, collapses and dies, victim of a heart attack. Clifford confirms Myra's death and exclaims to Sidney that their plan has been successful: Clifford's murder had been staged to shock and kill Myra. That is just act 1. 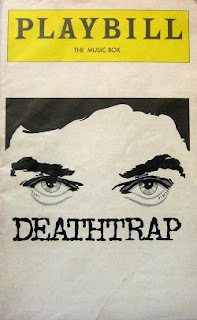 Following a Boston tryout at the Wilbur Theatre, Deathtrap enjoyed a 4-year run on Broadway, opening under the direction of Robert Moore February 26, 1978, at the Music Box Theatre, moving to the Biltmore Theatre January 7, 1982, and closing on June 13 of that year. It received a rave review from New York Times theater critic Walter Kerr, who wrote that it contained "effrontery everywhere and fun straight through." However, the Times' other theater critic, Richard Eder, panned the play. Seldes appeared in every one of the play's 1,793 performances, a feat that earned her a mention in the Guinness Book of World Records as "most durable actress." Cast replacements as Sidney included Stacy Keach, John Cullum, Robert Reed, and Farley Granger. Deathtrap was nominated for 1978 Tony Awards for Best Play, Featured Actor, Featured Actress, and Best Director. Deathtrap also won Levin his second Edgar Award, for Best Play, after his 1968 award for Best Novel. The play is known as one of the biggest hits on Broadway, running for 4 years with almost 1,800 performances. The preface to the published script describes it as "something so evil that it infects all who touch it. The thing has a life of its own. In Deathtrap, Levin has taken the basic components of thrillers and horror stories; murder, deceit, innocent dialogue with hidden sinister meanings, plot reversals, unexpected turns of events, etc., and twisted and rearranged the pieces again and again." In his book Murder Most Queer, theater scholar Jordan Schildcrout examines the critical reception of the play and comments on the play's status as a "postmodern thriller" that uses the closet to create suspense and murderous violence.